calenco and me, both armed with our cameras we use to walk around the city looking for "mirrorprojects". 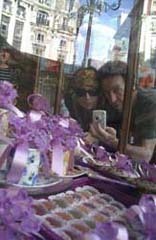 this photo is in Sevilla Square, in the very center of Madrid, over the window of one of the oldest sweets shop in town, them especiallity are the candies made with violets. 30076 Sir Nathan Coffey, esq. 30079 Sir Nathan Coffey, esq.